There’s plenty more than what’s on our list, but we’ve got a good list to start off the shy samplers and the bold eaters in your group. Why not try some of Australia’s signature treats while you’re here? Often referred to as the “National Cake of Australia”, the lamington is a square shaped sponge cake coated in a layer of chocolate icing and flaked coconut. This Aussie treat sometimes comes with a layer of cream or jam in the middle, and is often seen at tea houses or cafes. A delicious and well-known dessert, the National Trust of Queensland even named the lamington one of Australia’s favorite icons. John Dory is one of Australia’s most popular and commonly found fish. Battered and fried and served with chips, or pan-fried with herbed oil on a bed of mashed potato with salad, John Dory is a versatile, meaty fish and popular Australian food. Try it at any of the seaside restaurants in Australia for a hearty fish ‘n’ chips paired with a “stubbie”, or beer that will have your mouth watering! If you’re a seafood fan, well you’ve come to the right country and you’ll have to try the national favorite, Barramundi. Perhaps the most Australian of all fish varieties, Barramundi gets its name from the Aboriginal language meaning “large-scaled river fish”. Barramundi is typically served pan-fried or seared skin-side first, and it’s often dished up as a fish steak with a herbed oil. You’ll find it on menus all over Australia, or if you’re in Sydney check out Peter Doyle for a great view of the Opera House while you dine. Calling this an “Australian” dessert is debatable since both New Zealand and Australia claim to have invented the dish in honor of Russian ballerina Anna Pavlova when she visited Australasia in the 1920s. 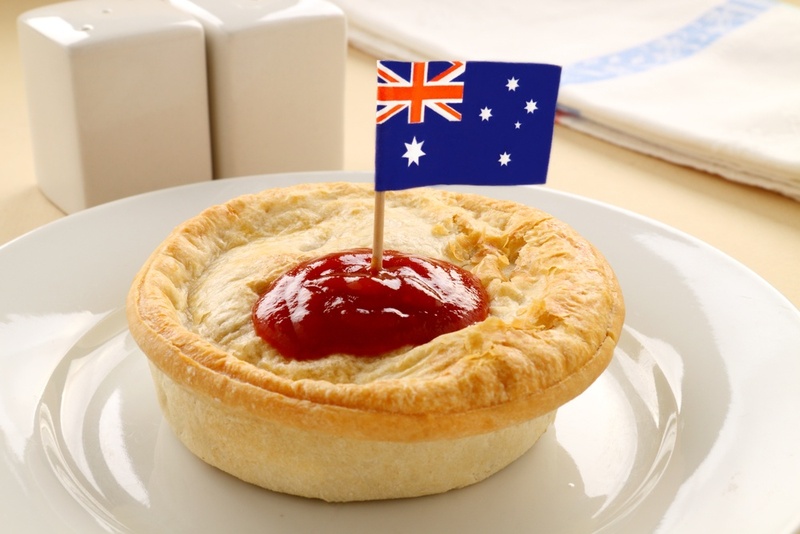 Although the facts tend to point towards New Zealand, Aussies would surely still label it Australian food. 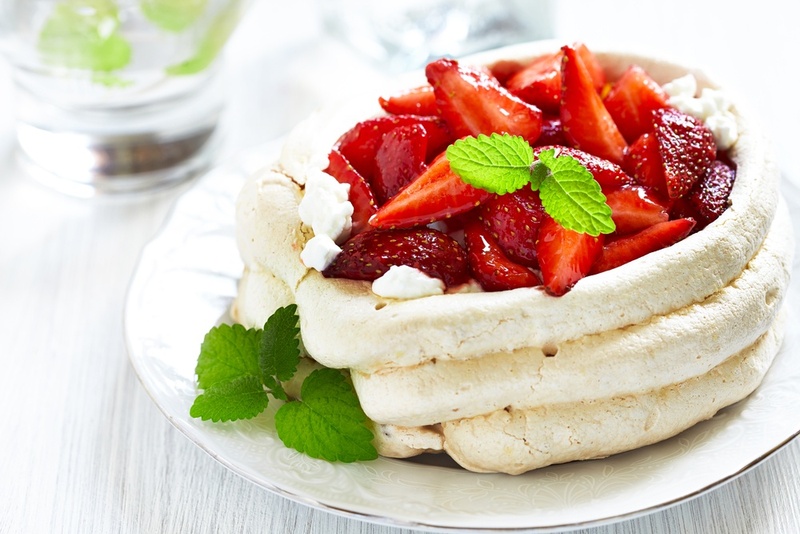 Pavlova is a popular meringue-based dessert that has a crisp crust and a soft, light inside and is often served at celebratory meals. Although these intimidating creatures are found all over the world, pop culture and movie lore link the crocodile to Australia. Crocodile leather is made into wallets, belts and handbags, its meat is consumed by locals, though it’s definitely more of a delicacy and not found on many menus. If you’re dying to try it, The Australian Heritage Hotel has a pizza featuring crocodile that’s been marinated in a Thai coconut sauce – definitely for the more adventurous eater. Our national animal is low in fat, and luckily some areas are overpopulated with kangaroos so you’ll find them on menus throughout the country. Kangaroo meat is not for lovers of well-done meat as it’s prone to drying out. It’s generally cooked rare to medium, often primarily seared on one side. Kangaroo goes well with garlic, pepper, juniper, rosemary and fruity flavors such as plum, red currant and orange. If you’re up for experimenting with this tasty meat, Blackbird Cafe in Sydney has a top rated kangaroo dish that served perfectly grilled with the chef’s special citrus marmalade and a generous side of veggies.